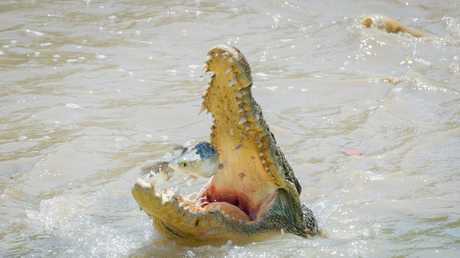 AS the saying goes, you should never smile at a crocodile - but this European tourist clearly never got the memo. The male backpacker was seen risking life and limb to snap a selfie with a deadly 4m saltie at Cahills Crossing. 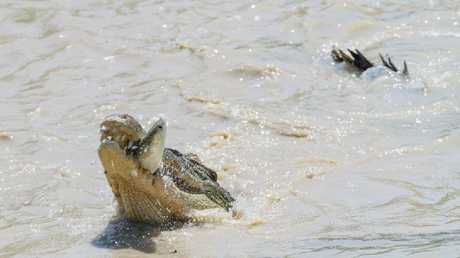 Darwin resident Sue English said she was out getting some pictures at the notorious croc-infested waters when she saw it happen. 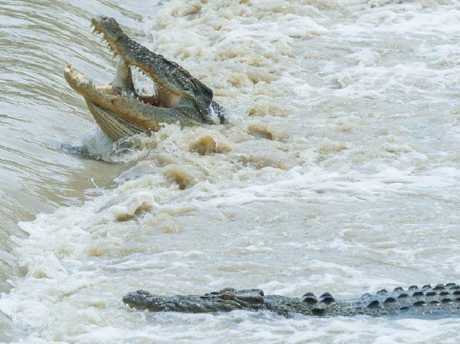 "It was high tide so there were about 11 huge crocs lined up along the crossing waiting for the fish to come over," she said. "It was phenomenal, those crocs aren't stupid. "We were on the platform but there were some European tourists down on the causeway. 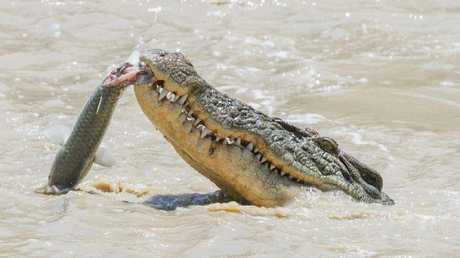 "One man was about 10 feet (3m) away from this huge croc that was lying in wait. "It easily could have just turned sideways and taken him out. "We yelled at him to get back but he didn't listen." 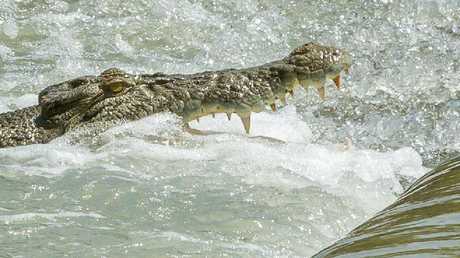 A spokesman for Parks Australia said Kakadu was home to about 10,000 crocs and visitors should follow safety warnings and avoid risks such as walking onto the crossing or near the water's edge. 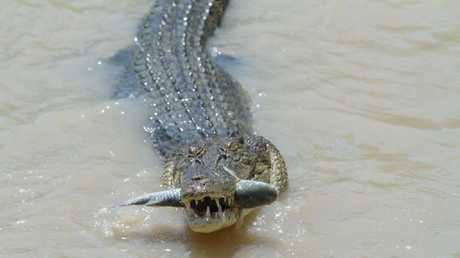 In the video a man, fishing from a high vantage point, latches on to a nice barra. He then heads down toward the same depth indicator post that the tourist is pictured standing near (in the photo at the top of this page) so as to not snag his line on rocks. 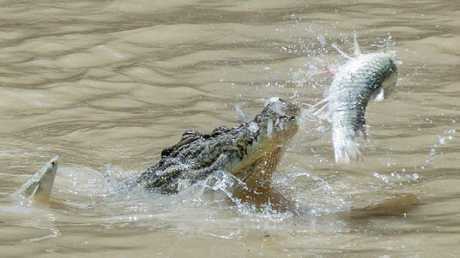 But, out of picture, a 4m croc has other ideas. The huge saltie, many times further away from the fisho than the big croc is from the tourist in our photo (top), covers the distance between them in a flash to rip the fish from the man's line. 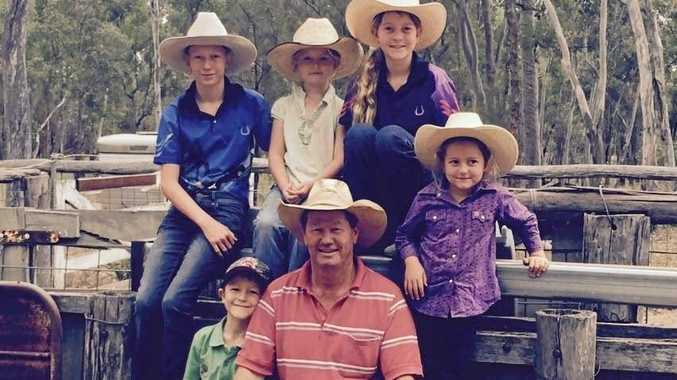 At the time, the fisherman in the video, tourist Luke Robertson, told the NT News: "I knew it was a bit risky but the plan was to stay well away from the water, even once I got my fish. "... I was about 5m away from the water - but my knees were shaking a bit towards the end."